Herschell Gordon Lewis’ follow-up to Blood Feast is a lot better and offers some laughably cartoonish violence (the bit with the guy in the nail-studded barrel has deservedly gone down in splatter-film history). In fits and starts it’s enjoyable, unless you live down south, which the movie demonizes. Six Yankees are tricked into taking a detour to Pleasant Valley, a literal ghost town decimated during the Civil War. Every hundred years, the town materializes. The townspeople welcome the tourists heartily as “guests of honor” for a big celebration, but they’re actually planning to isolate the Yanks and butcher them. 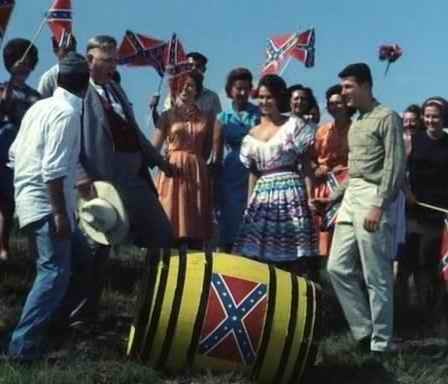 The amusing thing about the script is that the rednecks keep trying to convince their victims that they won’t be harmed, right up to the obvious moment of slaughter; the movie generates much paranoia about “southern hospitality.” (Remember, too, this came out long before Deliverance.) After the first, hard-to-watch killing (a woman gets her thumb and arm hacked off for a barbecue), the murders are, interestingly, all hands-off — a man is tied to four horses, a woman is crushed by a rock. Only Thomas Wood and Connie Mason (the stars of Blood Feast) escape, by tricking a monstrous little kid who hesitates so long in handing over Mason’s car keys that we just want to throw him off a cliff. Great bluegrass score by the Pleasant Valley Boys, with a theme song (“The South’s Gonna Rise Again”) penned and sung by Lewis himself. 10,000 Maniacs took their name (inaccurately) from this film.